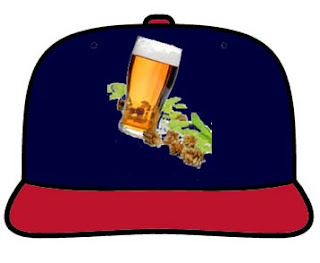 A 30+ year Brewer fan has proposed and designed new uniforms for the Brewers. He offers a style very similar to the old ball-and-glove look of the late 70's and 80's as well as a "New Classic" look which is sort of a cross between the current style and the old Milwaukee Braves look. Good for him. I have never liked the current Brewer uniform or logo. While it's better than the green, blue and gold look of the Chuckie Carr era, I've always felt it too lavish and ornamental for a town like Milwaukee. And the "M" with the wheat - that just never did anything for me. In fact, probably two-thirds of the Brewers garb I own are of the retro ball-and-glove look rather than the current design. I'd like to throw my own hat in the ring if you will. How about this...? UPDATE: Apparently the Brewers are announcing a new alternate jersey on February 14.